"It was a love at first taste," says the 25-year-old, who first tried the snack at age 4. 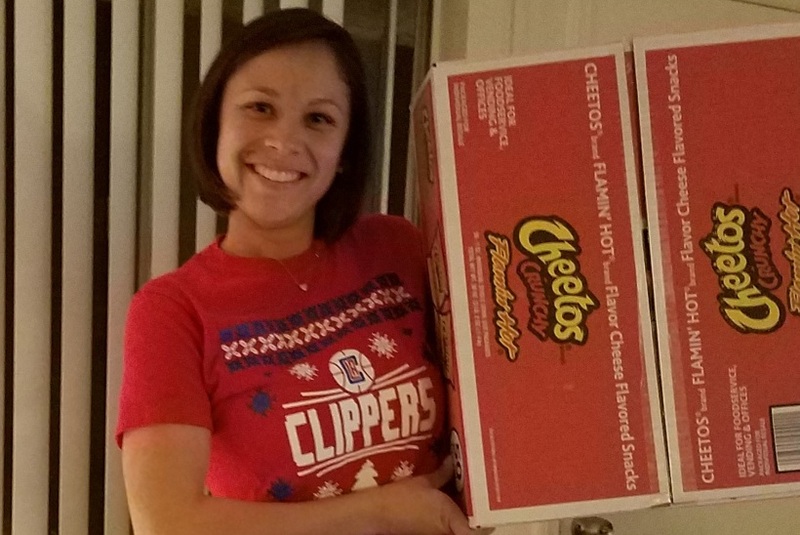 Rebecca Jimenez doesn't like just any Cheetos. She prefers the hot, make-you-guzzle-a-gallon-of-water ones. Her fascination began at age 4 when her older brother Isaac opened a bag. She asked to try the orange chips—and he warned her of the heat—but she ate one anyway. "I ate my first Cheeto, ran and got some water!" she remembers. But this didn't deter Jimenez. With water in hand, she finished Isaac's entire bag and has consumed a bag almost daily ever since. Why do you love Cheetos? It's my life! Just the thought of hot Cheetos makes my mouth water. It was a love at first taste. You know when you get home after a long day at work and just want to relax or reward yourself with a beer, knowing you got that 20 minutes or so just to yourself? Just thinking about it makes me want to pop open a bag! That's how I feel when I eat a bag. It's pure pleasure! When I think of the brand, I think of me! How do you show your Cheetos love daily? 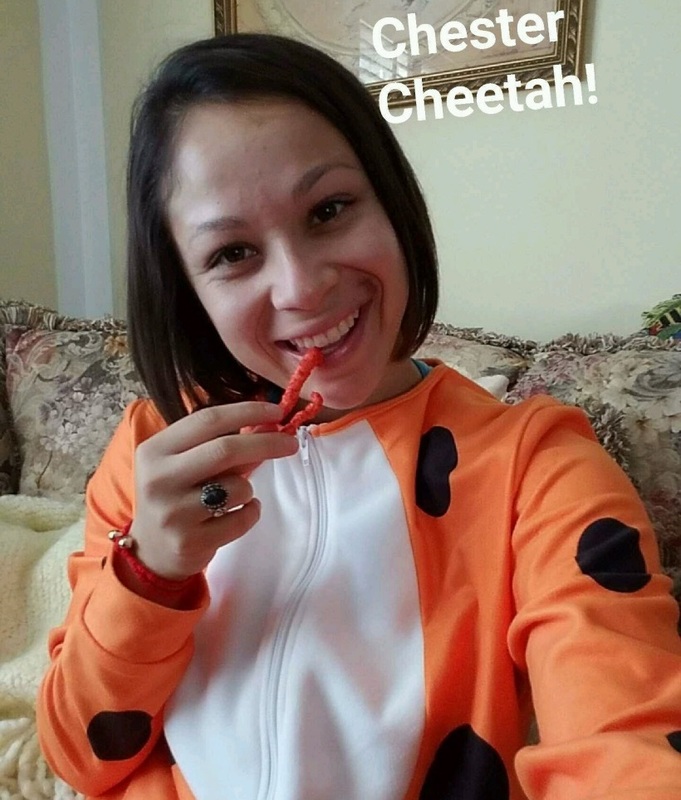 What's your coolest piece of Cheetos swag? I have a shirt I bought myself in 2016 that shows a feminine hand holding Hot Cheetos. It says, "Cheeto Fingers Por Vida," which means "Cheetos Fingers Forever." The runner-up is my Chester Cheetah PJs my boyfriend gave me for Christmas this year. What's the craziest thing you've ever done for the brand? I lied to my mother about my lunch money for eight years. She would give me a $1.25 for my lunch almost every single day from first to eighth grade. I wouldn't eat lunch. I saved my $1.25 for the ice cream man: Hot Cheetos with lemon con chili! All the local ice cream men knew my order. If mom didn't give me lunch money, I packed a lunch, and duh, of course, there was always a bag of Hot Cheetos in it. But what momma don't know won't hurt her. She never found out. How many ways can you eat Hot Cheetos? Sometimes I like them dry, normal, how they come. Most of the time, I squeeze lemon, Tapatío, chamoy, a tiny tomato juice (clamato) and a pinch of soy sauce, but for sure, lemon every time! Soo bomb! If I'm really treating myself, I'll cut cucmbers (pepinos) and put them in the bag, too! That's what we call, "a sensational bag." What's the nicest thing Cheetos has ever done for you? The nicest thing the brand has done for me probably has to be just all the memories I have from them. My mother ran a childcare business from our house, so whenever the ice cream man would pass by, I would sprint out there with my money. The daycare kids would be jealous that I could leave the house whenever I wanted because they couldn't just run out to the ice cream man. Mom would make me eat my Hot Cheetos in the backyard, so the kids wouldn't see me. That was a drag. I also have memories of my great grandma Mona in her wheelchair asking me for some Cheetos, and I would give her only, like, two. My grandma Lidia would make me give her a full hands worth. Sharing my Cheetos in general is something I hate doing. On flights to Hawaii, Florida, Chicago and Las Vegas as well as the seven-hour drive to Yuma, Arizona, best belive I had a tons of Cheetos for the ride! In the fourth grade, our class learned how to label and send mail. We had to pick anything that had a mailing address. I bet you don't have to guess who I mailed my letter to—the Frito Lay Company! I never received an answer from them, but it was also the last week of school. The memories Frito Lay has given me is truly a blessing! Now, I'm a 25-year-old who brings Hot Cheetos to Dodger games, Clipper games and Steeler games! The memories! I would change the prices! Make them the same price they were in the early '90s with a full bag. I buy a $2 Hot Fries bag, and half the bag is full of air! I make sure I find the bag with my name on it! I move the bags around and find the fullest, most dark red bag I can find! Also, When I was in Florida, I couldn't find Hot Cheetos anywhere! It would've made my Florida experience way better if I had found Cheetos in Orlando! I'd be more comfortable traveling the United States knowing I could find a bag of Hot Cheetos or one of the other bags I like! What's the one thing that would make you disloyal to Cheetos? If I ever got pregnant, I'd try to slow down because I don't think my tummy could handle the chili. If I found out Frito Lay was supporting companies that help causes I do not care for—like how I just found out Wells Fargo is helping Donald Trump fund that pipeline over Native American land—I would have to cut off the Hot Cheeto brand. Nestle, Coca-Cola, Kellogg, Modelo. Also, Flaming Astroids from Frito Lay were hands down the best chips in the whole world, and I'd probably do almost anything to bring those back!